Even before their adoption in the Summer of 2010, the Common Core State Standards (CCSS) had their advocates and their critics. Recently, however, that criticism has made its way into the popular press. Knowing that I've worked on related projects at the Bill & Melinda Gates Foundation, friends and family have asked my opinion. The Common Core State Standards themselves. State Longitudinal Data Systems (SLDS). In this post I'll address the Common Core and what distinguishes it from a curriculum. In a future post I'll write about inBloom and other data systems. And one more post will cover the assessment consortia. The concept of state core standards gained prominence during the Bush Administration as part of the No Child Left Behind act. In a recent blog post I wrote about how they are part of the Standards and Accountability theory of education reform and how later and more promising theories also rely on quality standards. The result of NCLB and related efforts is that each of the 50 states developed its own core standards. This has the vague advantage of more local influence but it has two significant disadvantages. First, there are differences between what students learn in different states. So colleges and universities don't have a consistent standard of preparation to expect from students. Second, developers of tests and curriculum spread their resources 50 different ways. The result is lower quality teaching materials and examinations. Starting in 2008 a consortium of state representatives developed the Common Core State Standards for ELA/Literacy and Mathematics. They don't include Science, Social Studies, History or any other subject. However they do specify literacy standards for Science and Social Studies. In other words, they specify that reading should be a significant part of those subjects without specifying the actual titles or subjects to be read. The standards are written in the form of "competencies" – that is, descriptions of things that students should be able to do. For example, standard CCSS.ELA-Literacy.RL.8.5 reads, "Compare and contrast the structure of two or more texts and analyze how the differing structure of each text contributes to its meaning and style." Standards like the common core describe what is to be taught while curriculum describes how it should be taught. Here are some ways that distinction applies: The Common Core describes the difficulty of text to be read at each grade; curriculum gives a list of actual books and stories. The common core describes the kinds of problems a student should be able to solve; curriculum specifies the order concepts will be taught and includes exercises to be performed. The rivalry between Phonics and Whole Language is not resolved by the Common Core; that decision remains in the hands of district curriculum committees. Critics of the core have missed an opportunity here. Since curriculum involves textbooks, lesson plans and teaching materials, it consists of thousands of pages, tens of hours of video and other media. It's also copyrighted. All of this makes reviewing a curriculum a daunting task – albeit an important one. Meanwhile, the standards are relatively short and accessible. They are released under an open license and you can read them online at http://corestandards.org. They total somewhere around 200 pages long including appendices so you can review them in an afternoon. They are different from previous standards. The ELA/Literacy standards start with a 50/50 balance between literary and informational texts (fiction and non-fiction) in the lower grades and increase that to a 30/70 split when social studies and science reading are included in upper grades. Reading in the English classes remains a 50/50 split through all grades. The focus in all texts, whether fiction or non-fiction, is on critical thinking and extracting arguments and meaning from the text itself. As a result, "response papers" where a student expresses their opinion or thoughts about a document are discouraged in favor of more analytical writing that identifies arguments, contrasts perspectives and uses evidence from the documents themselves. Many English teachers have objected to the shift away from an emphasis on fictional reading and writing. Picking up on that, one pundit suggested that Huckleberry Finn would be eliminated in favor of the phone book. Of course, the phone book isn't what the Common Core means by "informational texts". A sample list can be found in Appendix B of the common core. Remember that actual reading lists are the domain of curriculum. That's why this is in an appendix; it's not normative to the standard. Examples of informational texts in that list include the founding documents of our country, Lincoln's "Gettysburg Address" and Ronald Reagan's “Address to Students at Moscow State University”. This isn't the phone book. To get an idea of how these texts might be taught, I recommend this video from David Coleman. He was a coordinator and key author of the ELA standards. In this video he demonstrates how to teach the standards using Martin Luther King's "Letter from a Birmingham Jail" and Lincoln's "Gettysburg Address." In both cases he shows the brilliance of the authors and how it's not necessary to teach a lot of background because the authors include the needed information in the texts themselves. Regarding the math standards, there are two important shifts from existing teaching practice. First is that they have reduced the total amount of information to be taught. The overall theme is narrower and deeper. For example they require fewer methods for solving quadratic equations (narrower), but they also introduce complex numbers and the possibility of an imaginary result to a quadratic (deeper). The second change is that they teach mathematics at three levels: conceptual understanding, computational and procedural fluency, and mathematical thinking. The overall goal is to help children become "numerate." That is, students should naturally apply mathematics to interpret things in their daily lives. So, what are the objections? A common one is that this is a federal program to control what our students learn. First off, this is a state-lead initiative, not a federal one. Secondly, the standards will only control teaching if the they are considered to be limits to what is taught. But they are really a floor, not a ceiling and most of the details remain left to the curriculum. Other objections come from academics arguing for or against certain pedagogical theories that the rest of us aren't familiar with. For example, advocates for both Phonics and Whole Language have complained that the Common Core is a capitulation to the other side. But the Common Core Standards aren't as opaque as all of that. As I wrote a couple of months ago, the English standards focus on a few basic skills applied to increasingly complex texts. The math standards cover the familiar topics of arithmetic, algebra, geometry and so forth. The biggest issue is that change is difficult and frequently unpopular. The changes demanded by the common core aren't easy ones. They require changes to curriculum; they require new lesson plans; and they require teachers to approach subjects in new ways. Many people are excited by the possibilities but it's not surprising that some would prefer to preserve the status quo. Unfortunately, status quo isn't good enough. 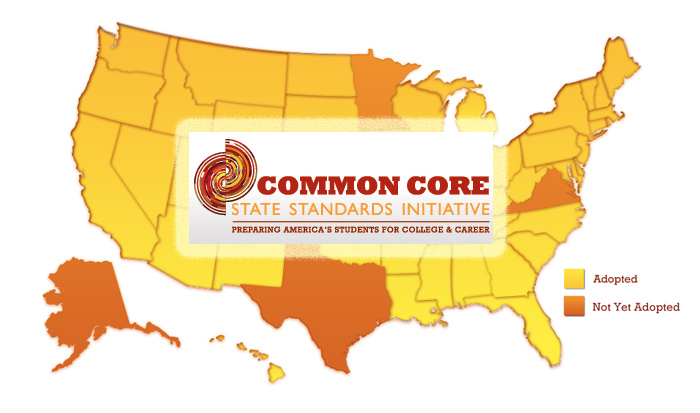 The Common Core State Standards offer two important advantages over previous state core standards. First is simply that they are common. We hope that by concentrating their efforts on one standard instead of 45, developers of curriculum and examinations can do a better job than before. The second advantage is that the Common Core is a second-generation standard built on a foundation of the best state standards and informed by the experience of those who built the first generation. Are they perfect? Not likely. But these new standards are better than previous ones and they will become a valuable tool in our personalized learning arsenal.